Falling Letters - Archived: Lemony Snicket - Who Could That Be at This Hour? 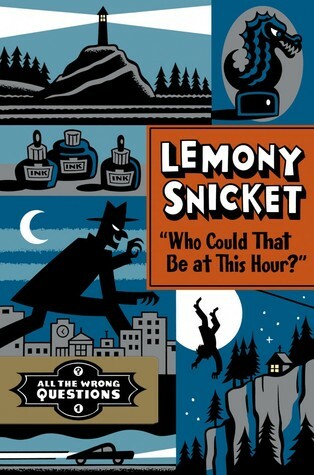 Lemony Snicket - Who Could That Be at This Hour? Title: Who Could That Be At This Hour? I spent my summer preparing for the release of this book by rereading A Series of Unfortunate Events. I know Handler said the two wouldn't correlate but that there would be some overlap for readers who like that sort of thing. As I reread ASOUE, I just knew there would have to be more overlap than I initially thought - Snicket's involvement with the Baudelaires and V.F.D. was just too great to be ignored in this biography of his childhood. Somewhat unfortunately, rereading ASOUE was a more enjoyable experience than reading this book. I think I overhyped the connection between the two series to myself. When I read the novel all I was looking for was overlap, not really paying attention to how the story stood on its own. Even so, the overlap was all I took away from this book. The story was pretty blah blah and the characters were many but none really intriguing for me (though they obviously were meant to be). I did like reading from young Snicket's perspectives - so different from the man he grew up to be! I loved, of course, 'a word which here means' and I was tickled at the end of the book to realize that Hector was that Hector. Compared to ASOUE, though, this book really fell short. It just didn't have any of the charm or emotion of the other Snicket books. An aside: The book itself is really beautiful and solid and a lovely object to hold - as you would expect from Seth! (Fortunately I just studied one of Seth's books in my Canadian comic books courses so I knew who he was when I picked this up ;P). I like the placement of components and the gold foil and the spine and the colours and the noir style.